I am soon to be the proud new owner of a Sunfire Classic Tube pre and have been reading old posts here. Several mention schematics but my search for the actual PDF's hasn't turned up anything. Can somebody provide a clue as to where I should look or who I should ask. I don't really need them right now, but it would provide peace of mind (and educational) to have them around. Right at this moment there are no Sunfire Schematics available to the general public that I am aware of. For some reason they, Sunfire have chosen not release this material. wrf wrote: I am soon to be the proud new owner of a Sunfire Classic Tube pre and have been reading old posts here. Several mention schematics but my search for the actual PDF's hasn't turned up anything. Can somebody provide a clue as to where I should look or who I should ask. I don't really need them right now, but it would provide peace of mind (and educational) to have them around. PM me your Email address and I will send them to you. If anybody else wants a copy, please PM me your Email address. So what other Sunfire schematics have people got a hold of and are willing to share ? I would really like to acquire one for a 300x2 as well as a subwoofer MK2. PM sent to Brian T. THANK YOU! General question - why on earth is Sunfire so tight fisted with the schematics? Are they trying to protect trade secrets? A thriving repair business? In my opinion, one of the great things about the old Carver equipment is that service info is freely available. The curious can learn how the equipment works, the motivated can fix their own equipment and the obsessive can modify it. I've seen photos of the inside of Sunfire equipment and it's appears to be very well laid out - high quality boards, silk screening and good accessibility. Hopefully someone will either come to their senses and release the info or perhaps even leak it. Carver is defunct; Sunfire is still a viable business, so there's money to be made. Schematics received from both Dr W. and BrianT. Many thanks to both. I received my Sunfire Tube Pre today and will be checking it out over the next few days. Welcome to the Sunfire Classic Vacuum tube preamp club and enjoy!!!!! I will say that one day maybe. For now, tom at vintage hifi and bill in washington are the ones that can get sunfire fixed. I have seen the light. 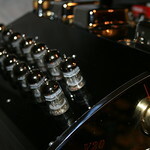 Snoop65 wrote: Welcome to the Sunfire Classic Vacuum tube preamp club and enjoy!!!!! Oh, yeah!!! Let the tube rolling begin!